Life in the window trade involves many hours spent on the road, which means you may have already spotted Sternfenster’s latest innovation “on the move”. With 39 StyleLine authorised retail partners and counting, the fabricator has invested in a dedicated transport solution for its highly successful, award-nominated range of windows and doors . 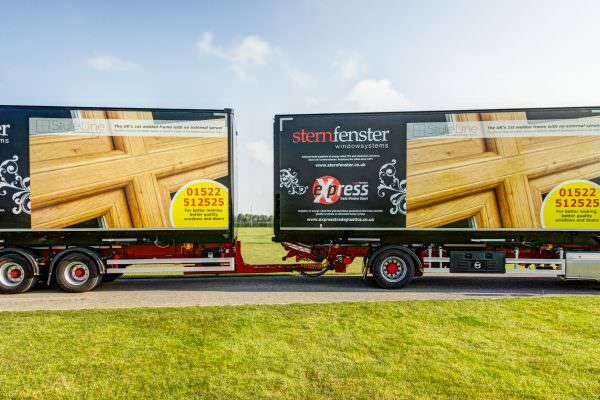 Five shiny new StyleLine-branded lorries and trailers have been added to Sternfenster’s transport fleet, to supply the fast growing number of dealers now selling the innovative windows and doors to the end consumer. The fabricator currently shifts over 1000 StyleLine frames per month and has attained, in average, 2 new dealers a month since the innovative new brand was launched, back in April 2015. Each retail partner enjoys StyleLine exclusivity in their area, enabling them to keep one step ahead of the competition in a very tight market. The vehicles are only the latest addition to the comprehensive package of marketing services Sternfenster are offering installers seeking to sell the StyleLine brand, including showroom support, consisting of sales-oriented visual displays, brochures, stickers, and an array of other initiatives designed to make the product even more appealing to style-conscious homeowners. “These marketing initiatives are meant to maximise end-customers’ exposure to our high-end brand, with the aim of increasing business for our installers,” said Steve. He added: “When we created StyleLine, we instantly knew it was a highly marketable brand, and that it was likely to be a big hit with the homeowners – but we’ve been taken aback by the positive reaction from installers and their customers. The G15 finalist range of windows and doors is available in a wide selection of profile systems, such as Deceuninck 2500 and 2800, Residence 9 and Spectus, allowing installers to provide a tailored fit for any project. Styleline combines the traditional aesthetics of timber with the performance, versatility and affordability of PVC-u. The products are the result of a revolutionary technical innovation, made possible by Sternfenster’s acquisition of a £260,000 state-of-the-art welding machinery, which directs the plastic sprue resulted from the manufacturing process inside the profile chambers, leaving the reinforced corner joint completely smooth on the outside, without the ugly grooves that mar most PVC-u windows. “We’re incredibly proud of what we’ve achieved with StyleLine – and our branded lorries are a testament to that,” concluded Steve.